When it comes to grasping the relationships of people and positions within an organization, nothing beats a good chart. With SpicyNodes, you can create an interactive chart in a matter of minutes. Yes, it’s that easy! An organization’s stakeholders  from the board of directors and management to employees and members or shareholders  need to understand lines of responsibility and which people hold which positions. That information can be conveyed in a table or as a list, but neither provide the at-a-glance advantage of an organizational chart. The problem with traditional organizational charts is that, as staff members come and go, charts quickly become out of date. In large companies, organizational charts are often unwieldy, difficult to modify, and a challenge to disseminate. With SpicyNodes, any assigned staff member can easily edit and update the chart, which can be accessed through a web interface by anyone within the organization. Organizational charts are ideal for sharing your strategic vision, as well as for defining dependencies and relationships. For sales people, entrepreneurs, and recruiters, charts make understanding organizations and updating information simple and intuitive  a key advantage in a competitive marketplace. SpicyNodes charts even enable project leaders to organize their teams by visually identifying roles, responsibilities, and lines of authority. 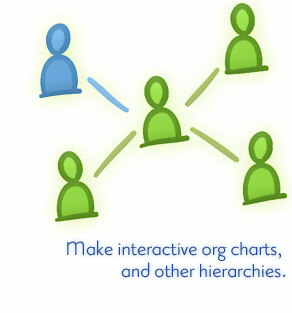 The charts are easy to edit and are infinitely expandable, allowing managers to add more staff and tasks to a project. It’s simple to rearrange responsibilities and deliverables, and to add additional information or links to web pages, photos, and other media. Users can zoom out to see the project at a glance, or zoom in for more detail. SpicyNodes charts don’t end with business. Indeed, they have a multitude of uses. Hierarchical graphs and similar diagrams can be used for everything from depicting different elements of a field of knowledge, to how languages relate to one another, to your family genealogy. When you go radial, you can fit a lot of information into a small space. But because SpicyNodes shows just a few orbits at a time, you’ll never feel overwhelmed with information. Be dynamic. You don’t need to be stuck with an out-of-date organizational chart. SpicyNodes makes it easy to edit and disseminate visualizations. Manage your projects. Organize your teams by defining roles, responsibilities, and lines of authority. Make better decisions. Allocate resources, provide a framework to manage change, and communicate operational information across the organization. Public or private. Share your organizational vision with the world, or limit access to those within your organization. Easy to implement. With SpicyNodes’ drag-and-drop editor, you don’t need specialized technical knowledge. Plus, SpicyNodes is customizable to fit the style of your site. Easy to get around. Employees or visitors can search your organizational chart, or zoom into a node for a preview of a staff member’s contact information.